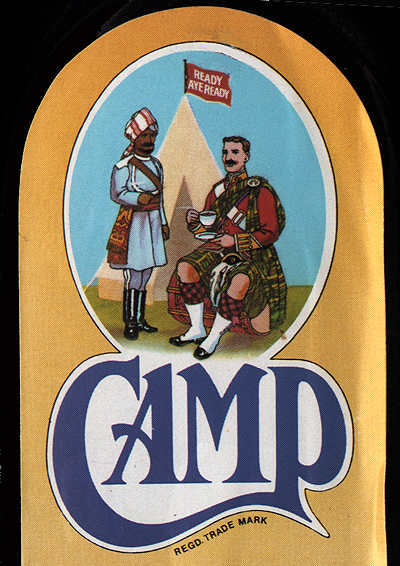 Camp - a thick black coffee syrup from Scotland with a groovy logo! This stuff may look like bunker-C, but pour some over ice and top up your glass with milk and you have a tasty treat you just can't beat (not even with a chilled glass of Bovril). Speaking of which, if you are beguiled by tar-like foodstuffs, you'll want to visit the Bovril Shrine, the award winning tribute to the determination of humanity to eat things God and Nature never intended. Another Tarry Goo You Eat! If you can't find Camp at your local grocery, you can order it from Cooke's Fine Foods in Kingston Ontario. It's not listed on their website, but when I emailed they said they carried it. Camp is the favourite tarry foodstuff of Sybertooth Inc.